Saint Mary Baptist Church of Port Barre. Greater Union Baptist Church of Opelousas. Mount Pleasant Baptist Church of Opelousas. All three of these churches were located in Louisiana, were historically black, and were burned down in the past month. Since the 1950’s, historically black churches in Southern states have faced racist attacks, including armed assault, bombings, and arson. Church burnings were common during the Jim Crow era, but several also faced arson throughout 2015. 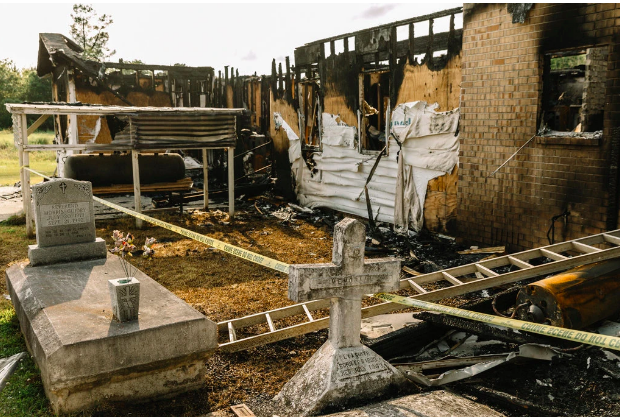 Saint Mary was the first church to fall victim, with the arsonist striking on March 24, 2019. Following the April 4 burning of Mount Pleasant Baptist, investigators were able to locate and arrest a subject. After law enforcement officials found a two-gallon red can of gas at the scene of the Mount Pleasant Baptist Church arson, they found a local Walmart that had the same type of gas can on sale. Investigators then discovered that on March 25, less than three hours before the first fire was ignited, several items-including the gas can, a lighter, and shop towels-were charged to Holden Matthews’ debit card. Investigators then discovered that Matthews’ father, a fellow law enforcement official, owned a beige pickup truck that matched the description of one that appeared around all three churches around the time of each burning. Police arrested the 21-year-old Matthews following these discoveries. Prosecutors charged the suspect with three counts of simple arson of a church building, each with a maximum penalty of fifteen years in prison. At the time of this writing, Matthews has no attorney and no history of violence or arrests. According to the fire marshal and other officials, “black metal,” a subgenre of metal music, may have led to the suspect’s decision to commit arson. The history of this music is oftentimes associated with church burnings, as evidenced by documentaries and literature. The National Association for the Advancement of Colored People, or the NAACP, described these fires as “domestic terrorism” and investigators believe they were “intentionally set” and related to one another. After the churches were burned down, including the 129-year-old Greater Union Baptist Church, Louisiana Governor John Bel Edwards spoke on the recent attacks.